site meeting today with the contractors and matthew smartt from the council to discuss positioning of the artwork. 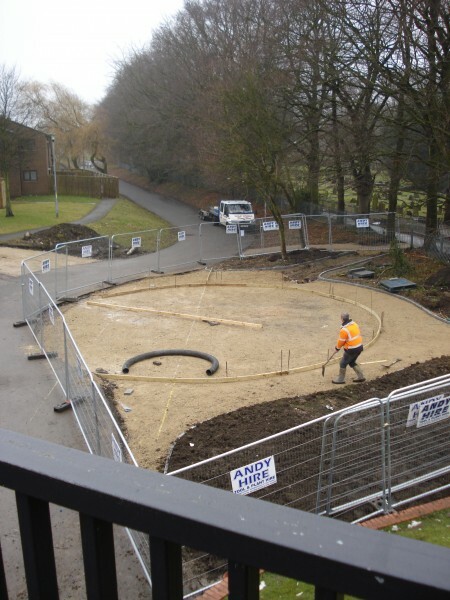 the centre circle is already cut and the landscaping begun. by coincidence work has also started on the new children’s play area the other side of the road bridge. we’ve been feeling a bit apprehensive in recent weeks with delays and discussion over the finer details of fixing the artwork in place so it was great to find the contractors (wilf noble & son of whitby) being so conscientious about the project – we seem to be in safe hands. credit also to matthew who has really gone the extra mile in making the project happen. it feels good to have the ‘gap’ in place and see the size the finished work will be when fixed together.